New research shows that early mathematics knowledge is an important predictor of later school success. Yet maths is one of the most misunderstood topics in early childhood. Many people think that maths is simply counting and recognizing numbers through school-based activities, but mathematics is so much more! When parents provide rich, everyday maths experiences at home, children gain a critical foundation for future learning - and an important connection is made between the home and school experience. This easy-to-read, beautifully illustrated booklet shows parents how they can help their children (birth-5) gain the mathematical thinking and skills they need. Instead of workbooks, special games, or other gimmicks, parents learn about the value of intentionally incorporating these concepts into everyday conversations and play with their child. 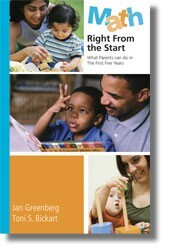 Includes recommended reading lists for babies, toddlers, and preschoolers.